And I was busy with other concerns. So, it was only five or six years later that I began to take notice of the marketing claims for the ubiquinol QH2 products. Because that is mostly what there is available to read, even today: marketing claims. I have looked for reports of research results and scientific studies, but I have not found much. It seems that the introduction of ubiquinol QH2 products has changed the industry into an industry in which more money is being spent on marketing than on research. It seems a sad development. Ubiquinone Q10 and ubiquinol QH2 are natural substances. They come from Nature. Nature is not, in the long run, one of those things about which we can take the attitude that, well, reality is what we say it is in our marketing claims, in the way that we do so often in the world of politics and in the world of business. Nature’s laws will undoubtedly prevail in the long run. The way to understand Nature is to do unbiased skeptical research. We need randomized, double-blind, placebo-controlled studies to remove as much bias as possible from our investigations. We need to do tests of statistical significance on the research results. In the long run, we know that we cannot fool Nature with our marketing claims. We can only fool ourselves. Why should we take ubiquinol supplements when we know that the ubiquinol will converted to ubiquinone Q10 in the stomach anyway and will be absorbed as ubiquinone Q10 in the small intestine? Why should we think that ubiquinol will be significantly more water-soluble when we know that both ubiquinone Q10 and ubiquinol QH2 molecules are resolutely fat-soluble? Why don’t we have a good pharmacokinetic explanation for the relative absorption of ubiquinone Q10 and ubiquinol QH2? Why isn’t there much more focus on the redox relationship of the Coenzyme Q10 molecule with its repeated and multiple changes from the oxidized Q10 form to the reduced QH2 form and back again? Differential absorption of ubiquinone Q10 after age 45? We do know that, after the age of 21, with increasing age, the human body synthesizes less Coenzyme Q10, which is the reason why even healthy elderly people should be taking a ubiqinone Q10 supplement. The Q10 researchers Kalen, Appelkvist, and Dallner showed that we humans synthesize ubiquinone Q10 as we grow; however, our synthesis of ubiquinone Q10 peaks sometime after the mid-20s for most people (2). Then, as age increases, our synthesis of ubiquinone Q10 decreases. It seems clear that supplementation will be important at age 40 or 45 years and for the rest of our lives. It is very difficult to get adequate amounts of ubiquinone Q10 in our food unless we eat prodigious amounts of meat and fish. In fact, according to the Q10 researchers Weber, Bysted, and Hølmer, we probably do not get much more than 5 milligrams per day from our food (3), and it is a good question what fraction of those 5 milligrams actually get absorbed. Something happens to Q10 absorption after age 40 – 45 to some people? 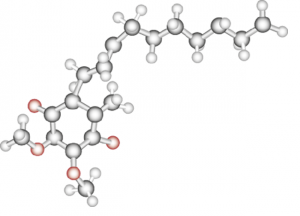 The claim made by the advocates of a ubiquinol QH2 supplement is that some people are genetically less able to absorb ubiquinone Q10 after age 45. I need to find the report of the research that this claim is based on. Specifically, I need to know how it is, bio-chemically, that some people, after age 45, lose the ability to absorb ubiquinone Q10 but allegedly retain the ability to absorb ubiquinol QH2. Is the answer to be found in some mid-life gene expression or some genetic mutation? Is the answer to be found in mid-life changes in the mitochondria? At present, I feel that I am fumbling around in the dark trying to understand the marketing claim that, starting in mid-life, people absorb ubiquinol QH2 better than ubiquinone Q10. I need to study up on these issues. Until I find out more, though, I am sticking with my ubiquinone Q10 supplement. I know that it has shown beneficial results in randomized, double-blind, placebo controlled studies. Also in elderly people. Take a look at the Alehagen’s KiSel-10 study conducted with elderly Swedish citizens (1). Don’t misunderstand me. The ubiquinol form of Coenzyme Q10 is important for its antioxidant function in the body. Ubiquinol holds its two extra electrons rather loosely, and it gives those electrons to harmful free radicals and stops the oxidative damage that a chain reaction of free radicals would otherwise cause. But, I think that I get the ubiquinol that I need whenever the ubiquinone is converted to ubiquinol in the energy production process in the cells. I don’t need to take a ubiquinol supplement to get ubiquinol. Remember, the Coenzyme Q10 molecules are converted back and forth multiple times from the oxidized ubiquinone Q10 form to the reduced ubiquinol QH2 form and back again. Over and over. Please click here for more information on the well-documented ubiquinone form of Coenzyme Q10.